The teeth are made of a substance called Hydroxy Apatite (2-Calcium Phosphate). By providing Calcium and Phosphate in the correct ratio, you enable the teeth to re-propagate enamel through the process of remineralization. In this way your teeth become strengthened without the need for the controversial mineral Fluoride. Ophir Naturals Remineralizing Tooth Salve does exactly this, providing Calcium and Phosphate, which is difficult to do in traditional toothpastes due to their affinity to reacting with each other. We also provide over 56 macro and trace minerals, including Ionic Silica (non-abrasive) and Magnesium, which support the process or remineralization, for healthy teeth and gums. Chlorophyll, a master detoxifier and deodorizer is used to promote and preserve fresh breath, working alongside botanicals, such as Frankincense, which has been shown, in vivo, to support the pathways of cellular regeneration. Why is there soap in your ingredients? Many natural options will use this method, and whilst it works, it is not a viable option for daily use. There are physical and chemical abrasives.... Physical abrasives are usually more aggressive, examples including baking soda or charcoal... Chemical abrasives are usually acids, such as strawberries or apple cider vinegar, which are often used in conjunction with a physical abrasive to remove stains, eg: strawberries and charcoal for teeth whitening. Although it sounds extreme, abrading or 'polishing' is an essential ad-hoc part of dental hygiene, helping to keep the surface of the teeth smooth, improving the rate of remineralization, and decreasing the ability of bacteria to stick to the tooth surface. Problems only arise when this is done on a daily basis over an extended period of time. 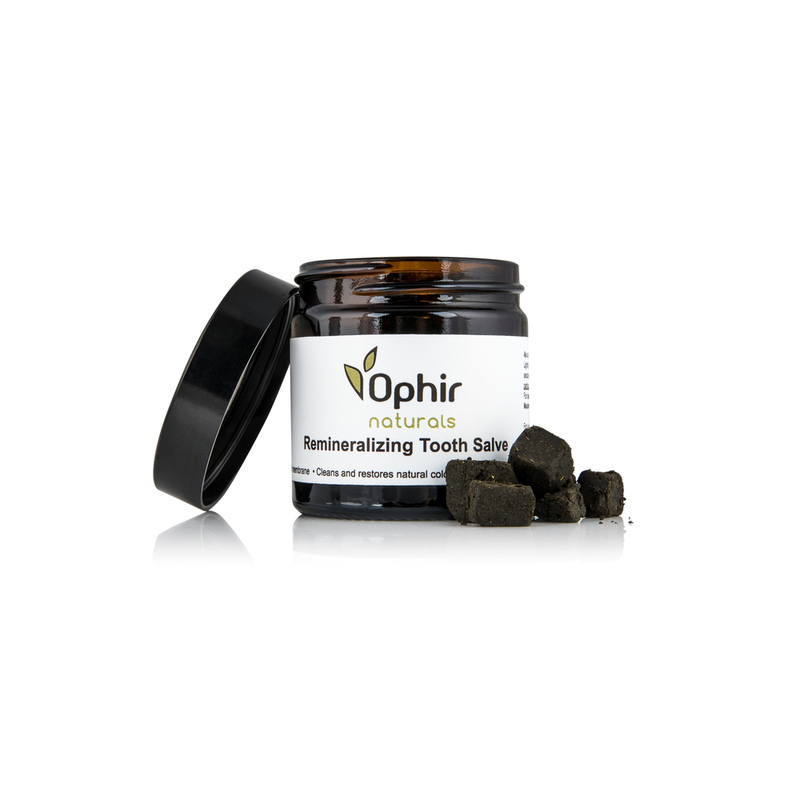 Ophir Naturals Remineralizing Tooth Salve is NON-ABRASIVE, and so can be safely used on a daily basis. These are a family of compounds which are able to lift staining, without being abrasive. Many of the commercially used surfactants are linked to being carcinogenic, such as 'sulfates' (SLS et. al.). We use an ultra pure form of Black Soap - a natural surfactant which is able to gently lift stains and dental plaque, and is also non-toxic, making it safe to swallow at the concentration used. When you ingest fat, your liver produces bile to break it down. When this bile mixes with the fat, it produces a detergent in your body. This detergent is almost bio-identical to black soap. When you swallow this type of soap, there are pre-existing pathways for its digestion - it is not recognized as a "foreign body". Whilst we don't directly recommend swallowing the product, it would not be problematic if it was; making it a great choice for children, the elderly or any individuals who have a tendency to swallow whilst brushing. Black soap also forms the basis (along with several botanicals) of the salve's anti bacterial action. By firstly lifting bacteria from the mouths surface, and secondly destabilizing their protective coating, which greatly enhances the botanicals' anti-bacterial capacity. It should also be noted that not all bacteria is bad - there are actually some species of bacteria which work in symbiosis with the mouth to keep it alkaline, protect and preserve gum/ dental membrane health, and aid in the uptake of mineral into the tooth. These bacteria also help to control the growth of fungus; protecting against conditions such as oral thrush and some forms of halitosis. 'Good Bacteria' and 'Bad Bacteria' thrive in different conditions.... Ophir Naturals Remineralizing Tooth Salve was formulated with this understanding; promoting the conditions for optimal oral well-being. Why does it come in pellet form/ why not a paste? We didn't want to make a natural product, and then weigh it down with chemical preservatives. The problem is, natural, non-GM products spoil - period. One of the major ways we give our product a long shelf life is through dehydration. Whenever you add water to a product, the shelf life decreases exponentially. If we presented this product in the traditional paste format, it would need to be refrigerated, and even then would only probably last a few weeks without us adding preservatives; some of the most efficient for this type of formulation (and allegedly dangerous) being the much discussed 'parabens'. The traditional 'paste' consistency is achieved with the use of ingredients such as sorbitol and/ or plain old vegetable glycerine, which whilst harmless externally, hinder the process of remineralization by blocking your enamel's pores when used as an ingredient in toothpaste. To reiterate; although'natural', Glycerine is a BIG no-no in toothpaste. 'Chewing', even for a few seconds, stimulates the salivary glands. Producing saliva is an essential part of oral hygiene. This saliva contains enzymes and 'co-enzymes' (such as bicarbonate) which activate the salve, making its nutrients more bio-available than simply adding water alone. By taking the water out, this product is also much more eco-friendly - a concentrated product weighs less and takes up less space, which reduces packaging and its carbon footprint, making the product more economic to the environment, and YOU. Will the Salve whiten my teeth? Strictly speaking, teeth are never (naturally) paper white. The only way to achieve this would be by using an oxygen based (-peroxide/-hydroxide) product with a catalyst (such as UV light) to physically BLEACH the teeth over several sessions. This process creates a lot of stress on the tooth organ, and just like bleaching hair, weakens and causes nerve and structural damage. As previously stated, Ophir Naturals Remineralizing Tooth Salve uses a natural surfactant to 'lift' staining.. in this respect, stained teeth will appear to be 'whiter', or more pearlescent than before with consistent use. Enamel is naturally semi-opaque or 'translucent'. The thicker enamel is, the more opaque/ less translucent it becomes. The substance underneath enamel is called dentine, which is yellow in colour. The thinner enamel becomes, the more dentine becomes visible. Containing the building blocks for enamel, phosphate and calcium, as well as a plethora of other ionic minerals including magnesium and silica, Ophir Naturals Remineralizing Tooth Salve will help to thicken weakened and thinned enamel, causing teeth to appear to 'whiter', or more pearlescent than before with consistent use. The smoother the enamel, the more effective it is at reflecting light, and so teeth appear 'whiter'. Ophir Naturals Remineralizing Tooth Salve works with the natural cycle of tooth enamel, which includes a process of mineral shedding (demineralization) and a process of mineral intake (remineralization). This natural process keeps enamel smooth in the same way that skin is kept smooth by shedding cells as new ones are propagated. This can be GREATLY enhanced with the use of a polish: a chemical or physical abrasive, such as a fine grade of bicarbonate of soda, charcoal, or chewing acidic fruits such as green apples or strawberries. Polishing also helps to remove staining.